Workshop 88 is a hackerspace (also known as a makerspace) located in Chicago’s western suburbs. Focused on science, technology, mechanics, culture and the digital arts we offer a space where people with diverse backgrounds can socialize, collaborate, learn and make. Through shared resources, knowledge and ideas we strive to create a space that promotes community and learning. For members the space is available 24/7. This is a great resource when you lack your own space or equipment for projects. We have public meetings on Thursdays from 6:30pm til 10:30pm that are open to the general public. The meetings are informal and are not structured so it is a great time to come check out the space and get a tour. We don’t even charge for the sales pitch you get. We have a variety of equipment and spaces for all types of projects. We have an electronics lab and a woodworking and metalworking shop. We currently have 3D printers, a laser cutter, vinyl cutters, and cnc milling machine . Some of our equipment requires certification with a member. We teach classes at the space and those can be found via meetup or our blog. We also will teach classes at libraries and schools as well as doing demonstrations for events. If you are interested in having us at one of your events or to teach a class contact us at info@workshop88.com. Workshop 88 is located at 41°52’37.0″N 88°03’58.2″W: 481 N Main St. Rear Building Unit B, in downtown Glen Ellyn, IL. 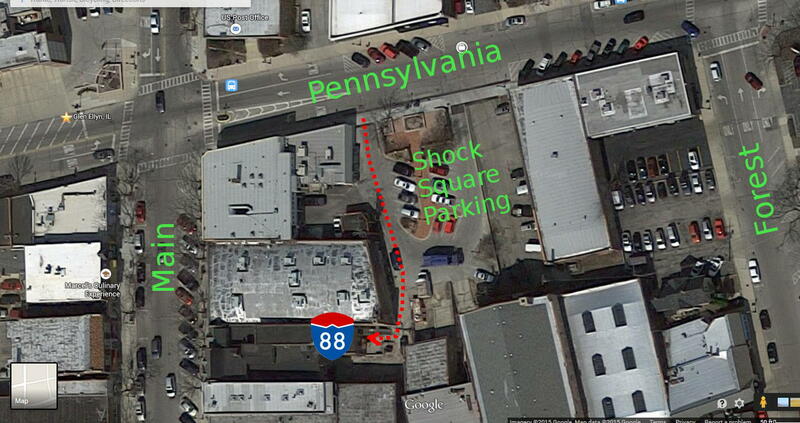 Despite the Main St address, access is ONLY through the Schock Square parking lot on Pennsylvania. If you are interested in learning more about Workshop 88 feel free to stop by for one of our regular Thursday evening public meetings or other events. You can also contact info@workshop88.com for more information or to schedule a visit. From the corner of Main and Pennsylvania in downtown Glen Ellyn, follow this video to find our location. Note that Honey Cafe referred to in the video is now A Toda Madre – “Creative market-fresh Mexican eats”.